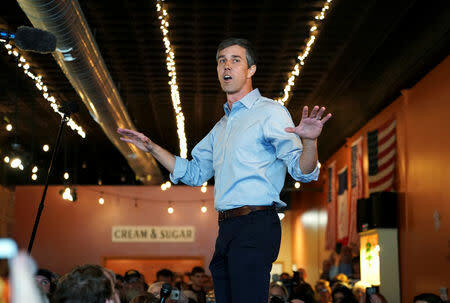 WASHINGTON (Reuters) - Beto O'Rourke raised more than $6.1 million within 24 hours of announcing his candidacy for the 2020 Democratic presidential nomination, his campaign said on Monday, highlighting his fundraising prowess in a crowded field. The former three-term Texas congressman's haul put him at the top of a Democratic pack of more than a dozen candidates so far including Bernie Sanders, the independent U.S. senator who sought the party's nomination in 2016. Sanders raised $5.9 million in the first 24 hours of his 2020 campaign. O'Rourke kicked off his presidential campaign on Thursday with a video on social media and a three-day visit to Iowa, which will hold the first presidential nominating contest in February 2020. O'Rourke gained national prominence from a 2018 U.S. Senate race that he lost. His underdog challenge to incumbent Texas Republican Senator Ted Cruz attracted capacity crowds and record fundraising. O'Rourke drew a record $38.1 million in one quarter - out of a total haul of $80 million - more than any other U.S. Senate race and more than three times Cruz's total. Some other Democrats showed smaller initial totals. Senator Kamala Harris' campaign said she raised more than $1.5 million in the first 24 hours. Her Senate colleague Elizabeth Warren drew more than $299,000 the day she launched her exploratory committee, Politico reported. U.S. Senator Amy Klobuchar reported raising more than $1 million in her campaign's first 48 hours, while Washington Governor Jay Inslee reported more than $1 million three days after entering the race. Contributions for O'Rourke raised online came "without a dime from PACs, corporations or special interests, he received contributions from every state and territory in the nation," his campaign said in a statement. PACs refers to Political Action Committees.